The relevance of the Tremaine-Weinberg (TW) method is tested formeasuring bar, spiral, and inner structure pattern speeds using agaseous velocity field. The TW method is applied to various simulatedbarred galaxies in order to demonstrate its validity in seven differentconfigurations, including star formation and/or dark matter halo. Thereliability of the different physical processes involved and of thevarious observational parameters is also tested. The simulations showthat the TW method could be applied to gaseous velocity fields to get agood estimate of the bar pattern speed, under the condition that regionsof shocks are avoided and measurements are confined to regions where thegaseous bar is well formed. We successfully apply the TW method to theHα velocity field of the Virgo Cluster galaxy M100 (NGC 4321) andderive pattern speeds of 55+/-5 km s-1 kpc-1 forthe nuclear structure, 30+/-2 km s-1 kpc-1 for thebar, and 20+/-1 km s-1 kpc-1 for the spiralpattern, in full agreement with published determinations using the samemethod or alternative ones. We have obtained blue integrated spectra of 175 nearby early-typegalaxies, covering a wide range in galaxy velocity dispersion andemphasizing those with σ<100 km s-1. Galaxies havebeen observed both in the Virgo Cluster and in lower densityenvironments. The main goals are the evaluation of higher order Balmerlines as age indicators and differences in stellar populations as afunction of mass, environment, and morphology. In this first paper, ouremphasis is on presenting the methods used to characterize the behaviorof the Balmer lines through evolutionary population synthesis models.Lower σ galaxies exhibit a substantially greater intrinsicscatter, in a variety of line-strength indicators, than do higherσ galaxies, with the large intrinsic scatter setting in below aσ of 100 km s-1. Moreover, a greater contrast inscatter is present in the Balmer lines than in the lines of metalfeatures. Evolutionary synthesis modeling of the observed spectralindexes indicates that the strong Balmer lines found primarily among thelow-σ galaxies are caused by young age, rather than by lowmetallicity. Thus we find a trend between the population age and thecentral velocity dispersion, such that low-σ galaxies have youngerluminosity-weighted mean ages. We have repeated this analysis usingseveral different Balmer lines and find consistent results from onespectral indicator to another. We measure the galaxy luminosity function (LF) for the Virgo Clusterbetween blue magnitudes MB=-22 and -11 from wide-fieldcharge-coupled device (CCD) imaging data. The LF is only graduallyrising for -22<-16. Between MB=-16 and-14 it rises steeply, with a logarithmic slope of α~-1.6. Fainterthan MB=-14, the LF flattens again. This LF is shallower(although turning up at brighter absolute magnitudes) than the R-band LFmeasured recently by Phillipps et al., who found α~-2.2 to befainter than MR=-13. It is similar, however, to the LFdetermined from the Virgo Cluster Catalog by Sandage et al. A few faintgalaxies are found that Sandage et al. missed because their surfacebrightness threshold for detection was too high, but these do notdominate the luminosity function at any magnitude. Most of the faintgalaxies we find are dwarf elliptical, alternatively called dwarfspheroidal, galaxies. The most important potential source of systematicerror is that we may have rejected some high surface brightness galaxiesfrom the cluster sample because we think that they are backgroundgalaxies. This is quite different from what has conventionally beenregarded as the most serious source of systematic error in this kind ofstudy: that we are missing many low surface brightness galaxies becausethey are never visible above the sky. There are ~2.5 times more dwarfsper giant galaxy in Virgo than in the Ursa Major Cluster, a diffusegroup of ~80 spiral galaxies at the same distance as Virgo, or the LocalGroup. The Virgo and Ursa Major Cluster LFs are inconsistent with eachother at a high level of significance. These results add weight to thehypothesis that is developing that dwarf galaxies are more commonrelative to giant galaxies in dense environments than diffuse ones. BothLFs are highly inconsistent with cold dark matter theory, which has beenso successful at reproducing observations on large scales. Possibletheoretical explanations for this discrepancy, and for the detailedshape of the Virgo Cluster LF, are investigated. We extend the exposition of a new kinematic method (exploiting geometricphase) for determining the corotation resonance radius of a grand-designspiral. We present an explicit formulation, in terms of first-orderlinear spiral density wave theory, for fitting to the velocity field ofa grand-design spiral galaxy. We test the new formulation on thevelocity field of the ionized gas in the grand-design spiral NGC 4321 inthe Virgo Cluster using Fabry-Perot H alpha data. The kinematic methodas currently implemented is useful specifically for determining an upperbound for the corotation resonance radius. We illustrate the kinematicevidence for the corotation resonance in the disk of NGC 4321. The UV properties of normal galaxies. III. Standard luminosity profiles and total magnitudes. In the previous papers of this series we collected and reduced to thesame system all the available photometric data obtained in theultraviolet (UV) range for normal (i.e. 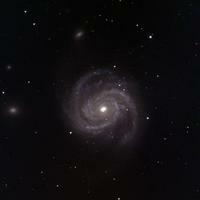 non active) galaxies. Here weuse these data to derive standard UV luminosity profiles for threemorphological bins (E/S0; Sa/Sb; Sc/Sd) and extrapolated totalmagnitudes for almost 400 galaxies. We find that: 1) the UV growthcurves are well matched by the B-band revised standard luminosityprofiles, once a proper shift in the effective radius is applied, and 2)the UV light in early-type galaxies is more centrally concentrated thanthe visible light. New near-IR images are presented for 13 dwarf galaxies in the Virgocluster. Together with previous data these provide a data base of JHKimaging for 26 dwarf ellipticals (dEs), dwarf irregulars (dIs) and bluecompact dwarfs (BCDs). These images show the dIs to be highly asymmetricand unrelaxed, implying that they are dynamically young and unevolved.This is consistent with their blue near-IR and optical-IR colours whichare most easily explained by young stellar populations. The dEs aresymmetrical and apparently relaxed, with very uniform colours indicatingthat they are dominated by old stars. They generally have exponentiallight profiles, but the brighter galaxies tend to exhibit more cuspedlight distributions, similar to the de Vaucouleurs profiles of brightellipticals. The BCDs have moderately asymmetric light profiles, andparadoxically red colours, possibly indicating an intermediate-agestellar population. They are probably dEs which have undergone bursts ofstar formation in the last few X 10^9^ years, whilst the dIs are afundamentally distinct population. Colour gradients are present in manyof the galaxies, invariably in the sense that the nuclei are redder thanthe surrounding galaxy light. Results are presented of photographic surface photometry carried out for305 (mostly dwarf) galaxies in the Virgo cluster, in which the galaxyimages were digitized on 14 of the 67 du Pont plates used for the Virgocluster survey. Azimuthally averaged surface brightness profiles areshown for all galaxies. The following model-free photometric parametersare derived and listed for each galaxy: total apparent blue magnitude,mean effective radius and surface brightness, and various isophotalradii, ellipticity, and position angle. Most galaxies were fitted by anexponential form and/or a King model profile. The best-fittingparameters, including the 'nuclear' (central residual) magnitudes fordE+dS0 galaxies, are listed. New colour images of dwarf galaxies. JHK surface photometry is presented for a total of 13 dwarf irregular(dI) and dwarf elliptical (dE) galaxies in the Virgo cluster, drawn fromthe bright end of the dwarf luminosity function. These images are usedto show that the structures defined by the old stellar populationsdiffer significantly between the two types of dwarfs. In particular, thedIs have more flattened and asymmetric stellar light distributions, andthere are no dIs with H-band luminosities or surface brightnesses ashigh as those of the brightest dEs. This is strong evidence against themodels in which dEs are formed by the gas-stripping of dIs. However, atight surface brightness-luminosity relation is found in the H-band,with a scatter of only 0.25 mag, including dwarfs of both types. This ispotentially a very powerful redshift-independent distance indicator. Oneof the galaxies studied, IC 3328, is found to have a prominent nucleuswith significant redder near-IR colors than the remainder of the galaxy. The azimuthally averaged surface brightness profiles of 200 faintearly-type Virgo cluster galaxies have been analyzed. Faint dwarfs arevery well described by an exponential or a King model. The magnitudes ofthe nuclei vary greatly at a given galaxian magnitude, but the maximumnuclear luminosity is a strong function of M(T). In the 0.1-1 kpc radiusrange, the logarithmically plotted profiles of all early-type galaxiescome in two well-defined classes identified with classical types versusdwarf types. The former are all classified E or S0, while the lattercomprise all galaxies classified dE or dS0, all morphologically'intermediate' types, and even two classified 'E'. The mean SB profilesof dS0 galaxies are indistinguishable from bright dE profiles. In 2D,the dS0s appear highly flattened and/or show asymmetric and irregularfeatures which may indicate their disk nature. A 57.5-MHz survey of a total of 133 (mostly late-type spiral) galaxieshas resulted in the detection of 68. The ratio of observed intensitiesto intensities extrapolated from higher-frequency measurements is wellcorrelated with the axial ratio of the observed galaxies, and isinterpretable due to increasing free-free absorption of nonthermalemission in galaxy disks with increasing tilt. The implied free-freeabsorption is interpreted as due to the pervasive presence of a clumpymedium of well-mixed, nonthermally emitting, thermally absorbing gaswith small filling factor. This paper presents the results of two or three color surface photometryfor a sample of 36 early-type galaxies obtained at the Canada FranceHawaii Telescope with CCD cameras. The calibration and data reductionprocedures are described. A comparison of the results with previous workis made for NGC 3379. For each galaxy the B surface brightness profilealong the major axis, as well as ellipticity and color profiles aredisplayed. High-precision BRI surface photometry of eight early-type Virgo clustergalaxies, obtained using a scanning CCD detector on the 60-inch Palomartelescope during March-April 1984, is reported. The data and the ellipsecharacteristics (determined by fitting the isophotes to aconcentric-ellipse model) are presented in tables and graphs andcharacterized in detail. Only galaxies with M(B) less than -18 are foundto have nuclear color gradients, with redward gradients in the twobrightest galaxies, isochromes flatter than the isophotes in theflattest color-gradient galaxy (NGC 4660), and small isophotal twistsand ellipticity changes in almost all galaxies. Attention is given to the technical aspects of photometric measurementsof 109 galaxies near the center of the Virgo Cluster, noting varioustypes of radii and surface brightness for about 50 E and dE galaxies inthe sample that range in absolute magnitude from -20 to -12. These dataare combined with data from the literature for giant E and dwarf Egalaxies in the Local Group to study the systematic properties of Egalaxies over a range of one million luminosities. The radial intensityprofiles derived are fitted to the manifold of King (1978) models toderive model-dependent central surface brightness, core radii, andcutoff radii. A photometric system using a broad-band color combined with a linestrength index is employed to distinguish age differences frommetallicity differences between the bulges and disks of S0 galaxies. Acolor difference independent of metallicity changes of about delta (U-V)= 0.10 is found for the sample of galaxies observed here. Several S0galaxies have absorption line strengths that indicate the disks are asmetal-rich as the most luminous elliptical galaxies. It is concludedthat the disks of S0 galaxies are probably younger than the bulges, butthe distinction between a younger turnoff and residual star formationcannot be made. A small number of low-luminosity elliptical galaxies are studied usingphotoelectric and photographic techniques. The color-magnitude relationfor ellipticals now extends from M(v) = -23 to -15, and is linear overthat range with a slope of 0.10 in U-V per visual magnitude. Galaxieswhich are known to contain a large number of young stars are from 0.10to 0.20 mag bluer than the lower envelope of the ellipticalcolor-magnitude relation. This difference can be accounted for by a lackof the most massive stars in a young population. Thus, the Balmerabsorption line spectra of the dwarf ellipticals which have beenobserved by others can be best understood as the signature of a youngpopulation which no longer has an upper main sequence of stars. Photographic photometry of Virgo cluster galaxies has been performed ina wavelength band extending from 1620-3200 A using sounding rockettechniques. The observational results are middle ultraviolet magnitudes,U2421, or faint limits for U2421, for 201 galaxies within 5.5 arcmin ofthe cluster center. A strong negative correlation is found between U2421- V and V for all observed S0 galaxies and a similar but weakercorrelation for the observed ellipticals. 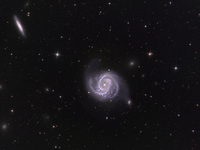 No such correlation is foundfor spiral galaxies regardless of their projection angles on the sky.The measured colors are generally compatible with colors computed frompreviously generated composite spectra. Strong evidence is presented to show that early-type galaxies of Hubbleclasses E and S0 can be classified into three sequences on the basis ofthe correlation between luminosity and effective diameter, effectivediameter and average surface brightness, or luminosity and averagesurface brightness. Evidence is discussed that the correlations aredifferent for different clusters of galaxies. The term 'populations' isintroduced to express the concept of systematic structural differencesbetween galaxies in various groups. The color-luminosity relation isreevaluated, and average (U-B) colors of early-type galaxies indifferent groups and clusters are compared. The results are found tosupport the concept of distinct sequences and to prove the existence ofdifferent populations. A luminosity estimator, which involves theaverage surface brightness, (U-B) color, and Hubble class of early-typegalaxies, is devised and used to derive differential distance moduli for48 groups, clouds, and clusters.